The Hair Clinic Montreal specializes in master-crafted custom wigs for over 20 years experience in providing you with unique, specially designed wigs to fit every head and every style. It is important to realize that today’s wig technology is miles ahead of what was available even two decades ago. If you need a wig because of health problems or genetics, you’ve come to the right place! We often get customers who are worried or nervous when entering The Hair Clinic, but there’s no need to worry: we are here to help. Seeing our customers holding their heads up high after getting a new custom wig is a great feeling and we’ll do everything in our power to make you feel comfortable. If you are worried about going to brightly-lit public places because you’re afraid that the thinning area of your hair will show, or if you’re worried about taking your hat off in the winter, The Hair Clinic is the perfect place for you – we will give you back the confidence and spring in your step that you deserve. The Montreal Hair Clinic specializes in custom wigs. We offer you many different types of custom wigs, from monofilament to polymer and lace. We believe that each and every woman should feel beautiful, and our custom wigs will certainly make you feel that way. Sometimes our huge selection of pre-made wigs simply isn’t enough, and you have something very specific in mind. Well, our human hair wigs are created from scratch just for you. Our specially trained custom wig technicians will precisely mould the balding area of your scalp & match it to your hair style, hair color, hair texture & percentage of gray. You can get exactly the wig of your dreams with the help of The Hair Clinic’s Custom Wig Lab. You have the choice between a custom made wig that you will be able to keep on for several days, or a custom made wig that you can put on and take off as you please. The Hair Clinic custom wigs made of the latest materials which allow you to keep your wig on for prolonged periods of time and yet lets your scalp breathe! Lace wig caps are also available for soft, stretchy comfort. The Hair Clinic’s goal is for the custom made wig to be as natural looking as though it were your own luscious growing healthy hair. It is of utmost importance to have a well-designed wig made with the best materials. Wearing a wig on a permanent basis can cause headaches or scalp trouble if the custom wig is not well adjusted. The custom wig also has to be breathable to allow air to circulate to your scalp. Our custom-made wigs are made with all the knowledge and know-how that modern technology provides, and will fit you like a glove. Our custom wigs are very lightweight and so comfortable you won’t notice you have one on. The Hair Clinic’s hand made wigs are simply the ultimate, natural wig. We have over 20 years of experience in translating your mental image of a perfect look into a real, luxuriously soft custom made wig. 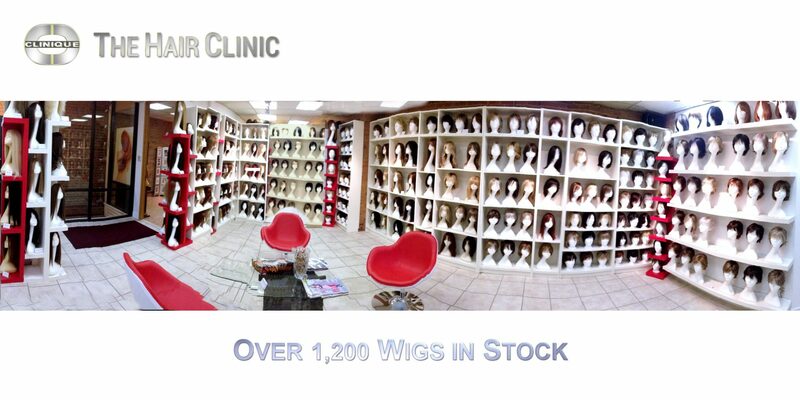 The Custom Wig Center at The Hair Clinic, specializes in all types of custom wigs including, custom front lace wigs, custom full lace wigs, custom polyurethane wigs, custom monofilament wigs and many more. Our custom wig shop can combine any of these cutting edge materials to create the best custom wig just for you! The Hair Clinic Montreal can also use your own hair to make your very own custom made wig. State of the art technology has combined with precision hand made custom wig-making techniques to create the world’s finest master hand crafted custom made wigs, hand-grafted one hair at a time. To emulate nature’s own design, each quality hair strand is individually inserted by hand into a patented silky sheer micro thin monofilament lace base, in a freestyle pattern, allowing you to style them any which way you desire. Single hair insertion makes each hair strand look as though it were growing right out of your scalp. Freestyle hair insertion yields unprecedented styling flexibility, allowing the lace front wig hair to be parted anywhere and in any direction. The revolutionary front hairline of The Hair Clinic’s lace front wigs incorporates Translucent Dermalens Technology for virtually limitless hairstyles. The Hair Clinic’s exclusive lace front wigs are made of soft stretchable materials for utmost comfort and a perfect fit, avoiding the pressure and irritation caused by ordinary wigs found in many Montreal wig shops. The Hair Clinic’s lace front wigs are available in 100% Human Indo-European Remy Hair, 100% Human European Remy Hair, or state of the art Hairlon Synthetic Fibers. The Hair Clinic’s lace front wigs are Hand-crafted masterpieces, found exclusively at The Hair Clinic lace front wig shop in Montreal. Have you been avoiding aquatic parks and beaches? The Hair Clinic’s custom made wig store is proud to offer you the unique and exclusive Non Surgical Graft. Non Surgical grafting is a revolutionary new method involves grafting 100% Human Hair, one hair at a time into “follicles” on a micro-thin, ultra-sheer polymer “skin”. The micro-porous new “skin” is then bonded to your scalp. Non-Surgical Grafts are fully watertight, permitting swimming & showering. How amazing is that? Now you can completely forget that you’re wearing a wig and enjoy all the activities you’ve been missing out on! At The Hair Clinic in Montreal, we take our time to answer all your questions and concerns, and the consultation is absolutely free. Feel free to make an appointment for an introduction to the high tech world of custom wigs & hairpieces in human hair, or drop by at any time to touch the lustrous, extra-soft hair 100% Human Indo-European Hair that we use in all our human hairpieces and feel the difference. We have nearly 20 years of experience in translating your mental image of a perfect look into a real, luxuriously soft custom made wig, hairpiece or volume enhancer. Whatever your reason for being interested in custom made hairpieces, our Hair Clinic in Montreal is the only place you need to find the custom made wigs you dream of! For the most natural looking human hairpieces and wigs made from human hair, look no further. The Hair Clinic on Crescent Street in downtown Montreal is waiting for you! Our staff will be happy to meet you and give you all the information about wigs & hairpieces in human hair, custom made just for your. Choose The Hair Clinic for the best quality custom wigs along with the most professional service. Hot hair is so cool, but so’s a $50 Discount Coupon on your first custom wigs at The Wig Center of The Hair Clinic on Crescent Street. At The Hair Clinic, we really can give you the hair of your dreams!